This website is best viewed in safari, chrome and Microsoft edge. The MedSelect™ Flex system is the ARxIUM go-to ADC solution. Along with a variety of additional technologies designed to supplement functionality, enhance fulfillment precision and improve overall efficiency and workflow in your facility. 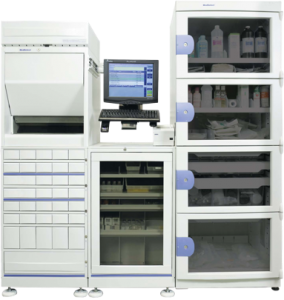 MedSelect Flex is the cornerstone of our automated dispensing cabinet (ADC) solution line, offering hospitals and long-term care pharmacy providers a modular and scalable fulfillment solution that helps reduce medication errors, control costs, comply with regulatory agencies and increase staff productivity. What Sets This Model Apart? Centrack™ is designed to close the loop on monitoring the complete life cycle of controlled substances in any medical facility, providing value in three key areas: increased inventory management, cost control and regulatory compliance. Nurses WorkStation is designed to address the increasing demand on nurses’ time. This system increases the speed of dispensing, improves patient safety and reduces the overall stress in the workplace. By providing remote access to the automated dispensing cabinet, NWS enhances total efficiency – allowing nurses to review/queue orders and document waste or discrepancies – without being forced to return to the physical cabinet. For more information regarding our Automated Medication Dispensing Systems, capabilities and pricing, contact ARxIUM today.